Castaño Santo in winter, originally uploaded by tree-species. 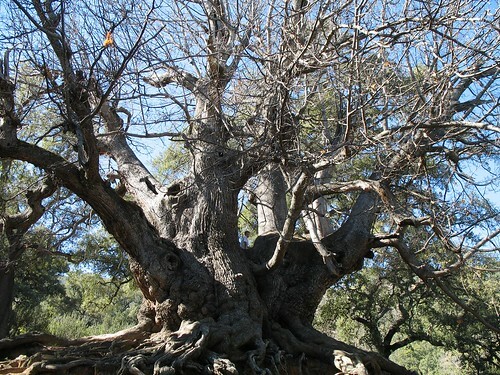 This is a very large Sweet Chestnut tree (Castanea Sativa) located up in the mountains above San Pedro de Alcantara in southern Spain. It is a rather difficult tree to find if you are not familiar with the area. There is a rough dirt road that starts at the backside of a golf course in San Pedro. Once you are on the right dirt road it is about an one hour of very slow driving (or hiking if you are up to it). The best way seems to be to go by Quad or dirt bike. About 20km up the dirt road you come to a sign and another dirt road where you turn left and go down about 200 yards to the tree following some signs. The Sacred Chestnut is in a stand of old growth trees that include some very large Oaks (most of which are Cork Oaks). The day I visited this tree I scared out a wild pig that was feeding on acorns under the Cork Oaks. The Sweet Chestnut is the tree that edible Chestnuts grow on.